Are you a patient or soon-to-be patient? He is all of the information you need to know about staying at Gold Coast Surgical Hospital. 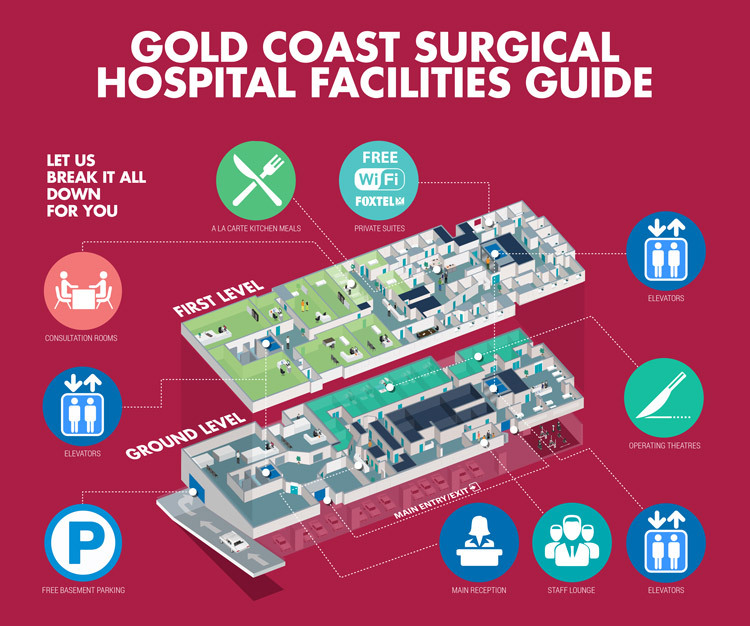 Gold Coast Surgical Hospital offers the highest standard of patient accommodation all with private ensuite bathrooms. All rooms have access to FOXTEL, Wi-Fi, direct dial telephones and individually controlled air-conditioning units. Your hospital experience and the care you receive will depend on your diagnosis. The plan of care is completed in consultation with your doctor and with you. The nursing staff will explain to you everything that is going to happen. If you find that the hospital "routines" are worrying you, we encourage you to talk to the nursing staff about these concerns. For your surgery, there are usually special preparations that you will require and you will receive these instructions from your doctors rooms. Our staff will be able to make your visit to the Operating Suite as comfortable as possible. It is very important that you approach your admission to hospital well informed of any costs you may incur. Please read the following information and contact your health fund if you have any concerns or queries. - Does my policy cover me for this procedure? - Do I have an excess payment on my insurance policy? - Are there any co-payments required for each night I will be in hospital? - Does my policy exclude some treatments, for example orthopaedic or rehabilitation? - Are any prosthetic or disposable items used in the surgery not covered by my insurance? Please note that if you have been a member of your health fund for less than 12 months your fund may not accept liability for the costs of this admission, e.g. if your condition or any symptoms of your condition existed prior to you joining your health fund. Any excess will be required to be paid on admission. Repatriation (DVA) Patients - Gold Card holders are covered for all care. White card holders are covered subject to approval by DVA. WorkCover Patients - total payment (aside from any ancillary charges) must be made on admission unless approval for admission has been confirmed by your insurance company. Third Party Patients - total payment (aside from any ancillary charges) must be made on admission unless approval for admission has been confirmed by your insurance company. Uninsured Patients - total payment (aside from any ancillary charges) must be made on admission. Please contact the hospital prior to admission for an estimate of fees and charges. As it is an estimate only, in the event of unforeseen complications or variations from the proposed treatment the cost may vary. Overseas Patients - If you are insured with an overseas company, you will be asked to pay the estimated cost on admission. Please contact the hospital prior to admission for an estimate of fees and charges. As it is an estimate only, in the event of unforeseen complications or variations from the proposed treatment the cost may vary. - Medical and allied health practitioners fees may be billed separately by the practitioner. Please discuss these with your doctor before your admission. The time that patients spend in hospital is getting less and less, as it has been shown that the best place to recover is in your own home surroundings. Shorter hospital stays however, mean that some patients go home before they are fully independent so planning for discharge allows you to think of ways of ensuring all of your needs are met. The staff at Gold Coast Surgical Hospital are dedicated to ensuring you are provided with the most appropriate care after discharge. We advise you to plan ahead for your discharge as much as possible. If you believe you will require assistance once you arrive home, please do not hesitate to alert our staff. Should you require in-depth discharge planning, our nursing staff will arrange for our discharge coordinator to assist with your needs. If additional patient care information is required after discharge this will be provided upon your departure from hospital. Discharge time is 10am. If you are unable to be collected by 10am, you may be asked to move to the waiting lounge. Patient feedback is appreciated, as it assists us to make ongoing improvements to our services and facilities. Please feel free to provide feedback either through the Nurse in charge, the patient feedback card/form in your room or by writing to the General Manager. Patient satisfaction surveys are conducted by the hospital regularly. If you are surveyed, your inclusion in these surveys is voluntary. We would appreciate your assistance if you are asked to participate. Please do not hesitate to contact the hospital staff for any further assistance. Laundry: Patients are requested to make arrangements to have friends or relatives do their laundry for them while they are hospitalised. Please ask staff if you require a laundry service and a local laundry-mat will arrange collection for a small fee.